Michael Joseph Fulmer (born March 15, 1993) is an American professional baseball pitcher for the Detroit Tigers of Major League Baseball (MLB). He won the American League Rookie of the Year Award in 2016, and was an American League All Star in 2017. Fulmer attended Deer Creek High School in Edmond, Oklahoma. As a senior, he went 10–2 with a 0.72 earned run average (ERA), 127 strikeouts and also hit .436 with six home runs. Fulmer committed to play college baseball for the Arkansas Razorbacks. Fulmer was drafted by the New York Mets in the first round of the 2011 Major League Baseball Draft. He made his professional debut that season with the rookie league Gulf Coast Mets which he had a 0–1 record with a 10.13 ERA and 10 strikeouts in three starting appearances and one out of the bullpen. Fulmer started 21 games for the Savannah Sand Gnats in 2012. He went 7–6 during the year with a 2.74 ERA and 101 strikeouts over ​108 1⁄3 innings. Prior to the 2013 season, Fulmer was ranked by Baseball America as the Mets seventh best prospect. He pitched in only nine games that season between the rookie league Gulf Coast Mets and the class A advanced St. Lucie Mets due to injuries. He finished the year with a 3.33 ERA and a 3-3 record with 42 strikeouts. Fulmer started 2014 with St. Lucie and finished the year with the Double-A Binghamton Mets. He started 20 games, going 6–11 with a 4.38 ERA and 87 strikeouts. On July 31, 2015, the Mets traded Fulmer and Luis Cessa to the Detroit Tigers for Yoenis Céspedes. Fulmer was named the Eastern League Pitcher of the Week for the week ending August 9, 2015. He started two games for the double A Erie SeaWolves during that time and had a 2–0 record with 11 strikeouts and a 0.00 ERA. He led the league in strikeouts (11) and tied for the lead in wins (2) and ERA (0.00). On August 28, 2015, Fulmer was named the Eastern League Pitcher of the Year, and was named as the starting pitcher on the Eastern League All-Star team. Fulmer finished the season 10–3 with a 2.24 ERA and 125 strikeouts in 22 starts for Erie and Binghamton. The Tigers added him to their 40-man roster after the season. On March 18, 2016, the Tigers optioned Fulmer to the Triple-A Toledo Mud Hens. Fulmer was called up and made his major league debut on April 29, against the Minnesota Twins. Fulmer earned the win in his debut, allowing two earned runs over five innings and striking out four in a 9–2 Tigers victory. 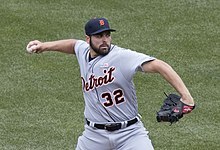 On May 21, Fulmer had his first home start at Comerica Park in Detroit, where he gave up just one earned run and recorded 11 strikeouts over seven innings, defeating the Tampa Bay Rays. Fulmer became the first Detroit Tigers rookie pitcher to strike out 11 opposing batters in one game since Pat Underwood in 1979. On June 1, Fulmer no-hit the Los Angeles Angels of Anaheim for ​6 2⁄3 innings before surrendering a two-out single in the 7th to C. J. Cron. He wound up allowing two hits and no runs over ​7 2⁄3 innings. On June 6, Fulmer pitched six scoreless innings, while allowing only two hits against the Toronto Blue Jays. Fulmer became the first pitcher in Tigers history to pitch three consecutive scoreless outings of six innings or more while allowing three or fewer hits. Fulmer pitching against the Baltimore Orioles in 2016. On June 12, Fulmer pitched six scoreless innings, while allowing only two hits against the New York Yankees. Fulmer became just the second pitcher in Major League history to pitch four consecutive scoreless outings of six innings or more while allowing three or fewer hits, joining Jake Arrieta. On June 17, Fulmer's scoreless streak ended at ​33 1⁄3 innings, surpassing the previous Tiger rookie record of ​28 2⁄3 scoreless innings set by John Hiller in 1967. This was also the longest consecutive scoreless innings streak by a rookie pitcher in baseball since Orel Hershiser threw 32 scoreless innings in 1984, but fell short of the all-time rookie record of 35 consecutive scoreless innings set by Fernando Valenzuela in 1981. On July 1, Fulmer pitched seven scoreless innings against the Tampa Bay Rays, allowing only two hits and striking out ten. Fulmer became the first Tigers pitcher since at least 1913 to allow one or zero runs in eight consecutive starts. On August 14, Fulmer recorded his first career major league complete game and first career shutout against the Texas Rangers. He finished the 2016 season with an 11–7 record, 3.06 ERA, 1.12 WHIP, and 132 strikeouts in 159 innings pitched. He had the lowest left on base percentage of all major league pitchers, stranding only 65.6% of base runners. Following the conclusion of the season, Fulmer was named the Sporting News AL Rookie of the Year, as voted on by a panel of players, finishing ahead of Tyler Naquin and Gary Sánchez, and was named the Major League Baseball Players Association Players Choice Award for AL Outstanding Rookie. Fulmer was also awarded the Baseball Writers' Association of America AL Rookie of the Year Award, receiving 26 of 30 first-place votes. For the first half of the 2017 season, Fulmer went 9–6 with a 3.19 ERA and 13 quality starts, earning him his first American League All-Star selection. On August 3, he was placed on the 10-day disabled list due to right elbow ulnar neuritis. An MRI revealed no ligament damage. Fulmer was reactivated from the DL on August 14. On September 11, it was announced that Fulmer would undergo elbow surgery for ulnar nerve transposition, ending his season. He finished 2017 with a 10–12 record, 3.83 ERA, 1.15 WHIP, and 114 strikeouts in ​164 2⁄3 innings. After pitching to a 3–9 record, with a 4.50 ERA prior to the 2018 All-Star break, Fulmer was placed on the 10-day disabled list July 20 with a left oblique strain. In his final start of the season on September 15, against the Cleveland Indians, he left the game without recording an out, after allowing two home runs on five pitches. On September 20, Fullmer underwent surgery on a torn meniscus in his right knee. He finished the 2018 season with a 3–12 record, with a 4.69 ERA, 1.31 WHIP and 110 strikeouts in ​132 1⁄3 innings. His ERA, WHIP and hits allowed per nine innings (8.7) were all career highs. On February 15, 2019, the Tigers signed Fulmer to a one-year, $2.8 million contract following a salary arbitration hearing. On March 19, the Tigers announced that they had recommended season-ending Tommy John surgery for Fulmer after he experienced elbow pain during a bullpen session. On March 20, Fulmer revealed that he will undergo the Tommy John surgery and will miss the 2019 season. Fulmer throws hard four-seam and two-seam fastballs that average 94–97 MPH (topping out at 99 MPH). His offspeed pitches include a slider in the 87–89 MPH (topping out at 92 MPH) range, and a changeup that averages 85–88 MPH (topping out at 91 MPH). After struggling to a 6.52 ERA in his first four major league starts, Fulmer made a concerted effort to throw more changeups. It became a very effective pitch for the rest of the 2016 season, with opponents hitting the pitch at only a .167 clip. In 2017, he started to throw a knuckle curve averaging 77-80 MPH, which he had formerly thrown in high school. Fulmer married girlfriend Kelsey Miles in January 2016. He works as a plumber's assistant during the offseason. ^ Lennon, David (June 7, 2011). "Mets draft pick Nimmo raises eyebrows". Newsday. Retrieved 29 August 2016. ^ DiComo, Anthony (July 31, 2015). "Mets land a slugger in Cespedes from Tigers". MLB.com. Retrieved July 31, 2015. ^ Rosario, Bill (August 10, 2015). "Knapp and Fulmer Win Weekly Awards". MiLB.com. Retrieved August 10, 2015. ^ "Fulmer named Eastern League's top pitcher". MiLB.com. August 28, 2015. Retrieved August 28, 2015. ^ "No. 1 prospect Fulmer optioned to Toledo". MiLB.com. March 18, 2016. Retrieved March 18, 2016. ^ Beck, Jason (April 27, 2016). "Tigers to start top prospect Fulmer on Friday". MLB.com. Retrieved April 27, 2016. ^ Cook, Mike (April 29, 2016). "Tigers Fulmer wins MLB debut, Tigers top Twins 9-2". CBSsports.com. Retrieved May 24, 2016. ^ "Tigers Fulmer takes no-hitter into 7th, Tigers top Angels 3-0". CBSsports.com. June 1, 2016. Retrieved June 2, 2016. ^ Needelman, Joshua (June 12, 2016). "Fulmer pitching himself into rare company". MLB.com. Retrieved June 12, 2016. ^ Fenech, Anthony (June 17, 2016). "Tigers' Fulmer allows first run in 33.1 innings". Detroit Free Press. Retrieved June 17, 2016. ^ Beck, Jason; Blum, Sam (July 1, 2016). "Fulmer's 10-K gem, V-Mart's HRs lead rout of Rays". MLB.com. Retrieved July 1, 2016. ^ Beck, Jason; Posner, Ryan (August 14, 2016). "Tigers' 4 HRs back Fulmer in 1st shutout". MLB.com. Retrieved August 14, 2016. ^ Beck, Jason (October 24, 2016). "Fulmer named Sporting News' AL Rookie of Year". MLB.com. Retrieved October 24, 2016. ^ Beck, Jason (November 9, 2016). "Fulmer adds Players Choice Award to haul". MLB.com. Retrieved November 9, 2016. ^ Beck, Jason (November 14, 2016). "Fulmer named BBWAA's AL Rookie of Year". MLB.com. Retrieved November 14, 2016. ^ Ortiz, Jorge (November 14, 2016). "Tigers' Michael Fulmer near-unanimous AL rookie of the year winner". USA Today. Retrieved November 14, 2016. ^ Woodberry, Evan (July 2, 2017). "Tigers' Michael Fulmer selected to 1st MLB All-Star Game". MLive. Retrieved July 2, 2017. ^ Weinrib, Ben. "Elbow injury sends Michael Fulmer to disabled list". MLB. Retrieved August 3, 2017. ^ "Tigers end Orioles' 5-game winning streak with 7-5 victory". CBSsports. Retrieved August 4, 2017. ^ "Tigers will activate Michael Fulmer from DL; option Bruce Rondon". The Detroit News. August 13, 2017. Retrieved August 25, 2017. ^ Beck, Jason. "Michael Fulmer to have season-ending elbow surgery". MLB. Retrieved September 11, 2017. ^ McIntosh, Adam (July 20, 2018). "Detroit Tigers: Michael Fulmer to the disabled list and other news". motorcitybengals.com. Retrieved July 26, 2018. ^ Fenwick, Tyler (September 20, 2018). "Fulmer undergoes surgery on right knee". MLB.com. Retrieved September 20, 2018. ^ Beck, Jason (February 15, 2019). "Tigers win arb case with Fulmer". MLB.com. Retrieved February 15, 2019. ^ Beck, Jason (February 18, 2019). "Fulmer takes arbitration results in stride". MLB.com. Retrieved February 18, 2019. ^ Newport, Kyle (March 19, 2019). "Tigers' Michael Fulmer Recommended to Have Tommy John Surgery on Elbow Injury". bleacherreport.com. Retrieved February 18, 2019. ^ "Michael Fulmer PitchFX at FanGraphs.com". fangraphs.com. Retrieved January 12, 2017. ^ "On Cloud Nine! Michael Fulmer married to his longtime sweetheart in January 2016". ecf. Retrieved December 22, 2017. ^ Beck, Jason (January 10, 2018). "Fulmer on track to be ready for Spring Training". MLB.com. Retrieved May 3, 2018. 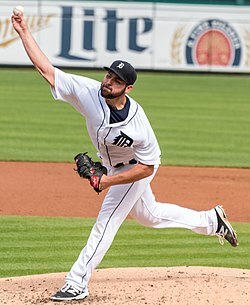 Wikimedia Commons has media related to Michael Fulmer. This page was last edited on 11 April 2019, at 03:54 (UTC).